Great composition! You were there at exactly the right moment. The delight on the girls face - to see the horse - is great. Police get a bad press, but in most towns where you see them on horseback they seem much more friendly, and people respond better to them; maybe it's the horse that calms them all down. Nice shot, great expression on the girl's face. A very good shot with a tricky light, the expression on the girl face is perfect. What a wonderful multiple portrait. 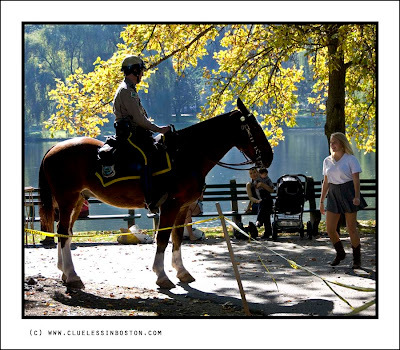 You have the girl, the gentle look on the officer's face, the noble horse, the woman with her baby looking up at the officer. Really a fine capture! The police use the horses for crowd control also. I have seen them use the horses effectively during Christmas rush around the shopping areas. I like seeing the cop checking out the girl! A great Autumn photo - great colors, lighting, shadows and subjects! So beautiful shot and perfect composition, I loved the horse, the young couple, the lights and the Autumn's scenery...just lovely! What a beautiful scene. The perfect moment, made all the more perfect with the light on the water and thru the trees. That is a great shot! I like the light in the background. You could write a short story about this one. Very nice photo, lots to see and nice light too. We have mounted police here in Leeds but I only rarely see them. Oh how beautiful this photo! Nice scene. The horse silhouetted against the sun works well. You have to smile when you see this!